Everyone is encouraged to join us for our annual dinner meeting, to be held on Sunday, October 8th at 6 PM. Click here for details and to register! It’s been quite a year and summer is here! Get ready to relax, refresh, reorganize and rejuvenate! WCMEA would like to congratulate you and thank you for all your hard work and dedication this year! BRAVO! Please renew your membership by August 31! Please note: this is a new address! Here’s what’s been happening and what’s coming! Thank you to our 2016-17 Festival Hosts! The festivals this year were all a great success! Thank you to all of our hosts. Excellent organization, hospitality and concerts. Our students enjoyed their experiences and so did we! Festivals Coming Soon…to a school near you! We are grateful to the gracious volunteers for our upcoming festivals! Mark your calendars now and be on the lookout in the fall for information from your 2017-18 hosts! We will miss you! We have some pretty amazing teachers in Westmoreland County! We would like to recognize all of our retirees and thank you so much for your dedication and service! Please remember that you are invited to attend our Fall Meeting in 2017 for FREE as a recent retiree so that we can recognize you for all your hard work…and you can tell us how amazing retirement is! We know of the following retirees… If we missed you or someone in your district, please contact Nicole Wolfgang so that we can add you to our list! Congratulations! Articles – Check it out! Here is a little music inspiration for you! Ukulele is taking the world by storm… and it is a great tool for your classroom! Here’s a great article about the ukulele’s therapeutic value. Law students at Duquesne University are taking a unique approach to handling the stress of finals: They are learning the ukulele. Check it out! WCMEA’s own Brian Querry of Burrell was one of the 290 national quarter-finalists for the 2017 Grammy Music Educator of the Year Award! * Leadership influence and impact in their respective communities. The award was presented at the Music & Arts Awards Program at the Midwest Band & Orchestra Clinic in Chicago, IL in December, which Brian and his wife attended. Click here to read even MORE! Need your strings to sing?! Local guidance counselor is offering guidance for your stringed instruments! disclaimer: Joe Golden and Westmoreland String Workshop is not affiliated with or sponsored by WCMEA. We are passing on his information as a professional courtesy. Ever wonder where you fit in our county? This map shows your piece of the puzzle. Thanks for all you do and have a relaxing and wonderful summer! I can be reached at home over the summer: nikki_wolfgang@yahoo.com or 724-537-6434. The students in all of the ensembles performed with a high level of musicianship. Our hosts were well-organized and gracious. Thanks for your hard work and extra time. We had several great workshop opportunities at the festivals as well as great conductors to observe. Thank You!! Looking ahead to this year… Thank you to our volunteer hosts this year. We are looking forward to more excellent festivals. Thank you for all you are doing! All paperwork should be in for these festivals on time please. Nothing is more frustrating for a host than needing to nag colleagues for paperwork. Please offer the hosts your help and especially a big “thank you” for their time and effort. Also, a reminder: YOU or a WCMEA MEMBER substituting for you MUST BE PRESENT throughout the ENTIRE Festival for safety and security reasons. Thank you Hosts and Directors! We desperately need someone to step up to host the 2017-18 JH Chorus Festival (next school year)! We really need to have this in place as soon as possible. Please consider hosting or teaming up with a colleague to host. This festival cannot occur if there is no host. Please email Nicole.wolfgang@glsd.us if you would be willing to help here. Thanks. This year we would like to recognize Joyce Cunningham and Paula Sokol of Belle Vernon for their outstanding service to music education for 25 years! Congratulations Paula and Joyce! Thank you for your hard work and dedication to the profession! We look forward to your festival this year! Both women were in attendance for our Fall meeting at Giannilli’s II where they shared stories from their yeas in the field and received 25 year plaques. As of the fall dinner meeting, Lauren McCurdy moved to the post of Past-President. Nicole Wolfgang, formerly the Vice President, has become the new President. Jeff Fox of Penn Trafford was elected to serve as our new Vice President while Jaime West was re-elected to serve as our Secretary Treasurer. Thank you to Denise Bilott of Norwin for faithfully serving us for the last 6 years! Please consider serving our organization as an officer in the future. If you would be interested in this or would like more information, please speak to one of the officers. Also, if you have any great ideas or things you would like WCMEA to do, please suggest this to an officer. Check out this Ted-Ed Lesson! Congratulations to these students for their hard work and best of luck in the future. Unfortunately over the last few years there has been a significant budget deficit (this past school year, the deficit was much more minimal). This year, we reduced spending to bring things closer to a balanced budget. Several years ago, we had a surplus and initiated a collegiate scholarship in addition to our high school scholarships. At the dinner meeting it was decided that the collegiate scholarship will be eliminated as funds do not permit it. Throughout the year at the festivals, we will be voting to increase the student registration fee at festivals from $3.00 to $4.00 (it was last changed in 2009) to help alleviate the deficit and keep with the increasing costs of everything. If approved, the change would take effect in for the 2017-18 school year. We also want to stress that in addition to the per student fee at festivals. As a part of WCMEA’s mission, we want to provide relevant Professional Development for all of our members, not just those that attend festivals. We are looking into partnering with Seton Hill University to provide workshops, webinars, etc. that may interest and serve our members. We know many of you need to obtain Act 48 hours or Professional hours and we want to help. If you are interested in helping with this or have a great idea for a workshop or webinar, we want to hear from you! Thanks!! There have been some great ideas brought up by the membership recently. Someone asked about having a county music library to share our repertoire. We discussed this at the dinner meeting. We seemed to agree that a physical library may be hard to manage, but the possibility of a county spreadsheet might be a nice feature. Here we could list music that we could lend. If this is something the membership wants to do, we will need to have a “Music Librarian” to manage the spreadsheet. Another, easy to implement idea was to collect all student music at the festival and distribute entire class sets to directors for more effective use of this purchased music. This is already done at some of the band festivals. Choral distribution would be a nice addition and can be discussed at the festival meetings. A member suggested that we have hosts provide the school’s emergency exit procedures to visiting directors ahead of time or in their information packet. A couple of members have expressed an interest in Vocal Jazz for their students. If anyone is interested in exploring this as a future festival or workshop, please contact an officer. We would need a couple of volunteers to plan the event. “Greensburg Salem School District will strike up the band Friday to honor seven people who led thousands of students during 56 years, creating countless hours of music. Officials, students and alumni are working together to pay tribute to the district’s former band directors during homecoming festivities before the football game against Belle Vernon. Best Wishes to Our Retirees! To those who have set wonderful examples, inspired young musicians and paved the way for music for many years…BRAVO! Thanks for all your hard work and service! If you or a colleague recently retired (or plans to retire this year), please email Nicole.Wolfgang@glsd.us so that your friends in WCMEA can honor you. Please let me know if you have good news to share, personally (weddings, babies, engagements, graduations, etc) or on behalf of your students (all-state musicians, concerts, musicals, etc) for inclusion in the newsletter. Thank you for taking a moment to read our WCMEA updates and news! I look forward to seeing many of you at the next festivals! If I can be of any assistance, please do not hesitate to contact me. Thank you to Jaime West for Web updates. I hope everyone had a wonderful relaxing summer! This year proves to be more exciting than last as we continue to move forward as an organization and also work hard for all of the music students in Westmoreland County. Although you may not get recognition from your administrators or core teachers in your building, your work is vital to our young people. Many of the kids come to school because of your music class. We know that we cover character education, STEM, 21st century skills and all other district programs through teaching music. So thank you for what you do, the passion which you approach your profession and your dedication to young people. 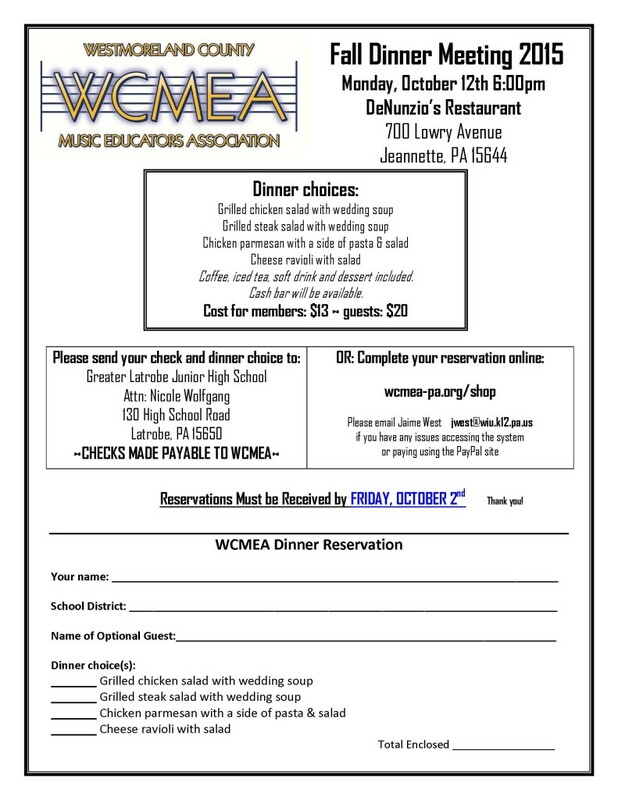 WCMEA will be offering three scholarships again this year. One chorus and one band scholarship will be presented at those festivals in November/December. This is open to any student who is planning on majoring in music education. They will not receive the funds until their sophomore year in college after sending a transcript to our treasurer. We are also offering a scholarship to a current music education major to help defray their costs. This is open to any Westmoreland county resident studying music education (they can be attending ANY music education program, it does not have to be within the county). The application and information are on our web site. Please pass this along to former students that you know are in college currently. Listed below are the staffing changes in the Westmoreland county schools. For new members to the district, I included their biography so we can all get to know each other better. Brandie Falk holds a BS in Music Education from Youngstown State University. As a college student she worked with the Mars Area and Kiski Area marching bands. Brandie taught 6 years of general elementary music in the New Kensington-Arnold School district. This year she is excited to teach at West Hempfield Elementary school in the Hempfield Area School District. She will be teaching general music K-5 as well as 4th and 5th grade band and choir. Mr. Donato began his clarinet study in 4th grade at Hartwood Elementary and participated in the band program in the Fox Chapel Area School District until graduating in 2004. Mr. Donato graduated from Duquesne University in 2008 with a Bachelor of Science in Music Education. Prior to his appointment in Jeannette City School District, Mr. Donato taught elementary and middle school general music and instrumental band at the Young Scholars of Western Pennsylvania Charter School in Baldwin, PA. He maintains a private clarinet/saxophone studio and is currently working on a Master of Education in Curriculum and Instruction degree at Gannon University. VALLEY JR/SR HIGH SCHOOL – GRADES 7 – 12 – Melissa Mazur will teach choir 9-12, Nick Smith will teach 7th grade choir plus band and Greg Sturgill will teach 8th grade choir and band. Timothy L. Ellison is a Visiting Assistant Professor and Director of Instrumental Activities in the Division of Visual and Performing Arts at Seton Hill University. At Seton Hill, Mr. Ellison teaches courses in music theory, conducting, marching band techniques, and oversees the university’s instrumental activities. He also serves as Music Director and Conductor of the Westmoreland Symphonic Winds, the Three Rivers Youth Wind Ensemble, and the Youth Honors Concert Band. Additionally, Mr. Ellison is a doctoral candidate in Instrumental Conducting at the University of North Carolina Greensboro, where he studied with John R. Locke and Kevin M. Geraldi. The focus of Mr. Ellison’s research is centered on composer Joel Puckett’s Short Stories: A Concerto for String Quartet and Wind Ensemble, which was commissioned and premiered by the University of North Carolina at Greensboro Wind Ensemble for the 2013 National Convention of College Band Directors National Association. While at the University of North Carolina at Greensboro, Mr. Ellison conducted the University Band and appeared frequently as a guest conductor with the Wind Ensemble, Symphonic Band, and Casella Sinfonietta. Mr. Ellison holds a Bachelor of Science in Music Education from the University of Tennessee at Chattanooga, and a Master of Music in Instrumental Conducting degree from Georgia State University. While at Georgia State University, Mr. Ellison studied with Robert J. Ambrose and was a frequent guest conductor with the Symphonic Wind Ensemble, Wind Orchestra, and co-conductor of the University Band. As an educator, Mr. Ellison has over ten years of teaching experience at the secondary and collegiate levels. He has taught undergraduate courses in conducting, and marching band techniques, and supervised student teachers. As a public school educator, his bands were privileged to perform for such dignitaries as the Governor of Georgia and the State Superintendent of Schools. In 2005, his high school band was invited to the United States Scholastic Band Association (USSBA) Inaugural Marching Band Championship in Baltimore. Mr. Ellison is an active clinician and adjudicator, working with student musicians across the United States. In addition, Mr. Ellison served on staff at the University of North Carolina at Greensboro Summer Music Camp, which enrolls nearly 1,800 music students each year. Mr. Ellison is an active member of the National Association for Music Education, the National Band Association, the World Association for Symphonic Bands and Ensembles, College Band Directors National Association, the College Music Society, and Phi Mu Alpha Sinfonia. A big thank you to our high school hosts Melody Vigo and Kevin Pollock for their high level of organization and professionalism in putting together top notch festivals for our Westmoreland county high school musicians. I was very impressed with the level of difficulty in the music and the way the students performed with expression as an ensemble. Very nicely done! Junior High Chorus: March 14th at Franklin Regional HS, hosts Denise McMullan and Lauren Bloomer, guest conductor- Kelly Newstead. Please respect all deadlines for applications, registration fees, medical forms and any other important paperwork. Nothing is more frustrating for a host then bugging colleagues for paperwork. Please offer your help and especially a big “thank you” when the festival is over. We all have lots of demands on our shoulders and these folks have stepped up to do this for our kids on top of their normal duties! We are pleased to announce that the Koter family chose our organization for memorial donations in honor of Donald Koter. To date, we have received $575. We will be setting that aside for our scholarships to support and encourage more young people to pursue music education. The officers are very grateful to the Koter family for this honor. Starting next school year, you have the option to pay your dues online. They will be $16 (one dollar more to cover the cost of a surcharge). Thank you to Jaime West for putting this together and re-working our web site. This year we had a question regarding the qualification for the 25 year WCMEA award and we noticed that we did not have officials wording in our by-laws. A discussion will be held at each festival meeting, a committee will meet in June and we will vote on the wording at our next dinner meeting. PMEA’s award uses these terms “Were you a first year teacher in the fall of 1988 or prior to 1988? PMEA’s 25 Year Award recognizes music teachers, elementary through college/university, who have taught 25 years (or more) with at least 15 years of teaching in PA.” If you have a suggestion or would like to serve on the committee, please e-mail Denise Bilott. From Denise: As of the fall dinner meeting 2014, I will be moving to past president and Lauren McCurdy will be moving to president. We are in need of someone (or a few people), that would like to run for VP. You would serve 2 years as VP, 2 as president and 2 as past president. If you are concerned about attending all festival and selection committee meetings we have arranged it that the board of officers splits duties so one person does not have to attend everything. I have truly enjoyed my time as an officer and getting the chance to meet all of you and serve our profession. When I agreed to be the VP, never did I think I would be a mother of three little ones by the end of my term! The workload is manageable and not too much additional stress…I promise! If you are interested or have any questions, please e-mail me. Our First Annual WCMEA Concert in the Park is Saturday May 31, 2014! As of right now we only have two applications for performances and NONE for concession. If you are interested, please download a form from our web site and send it to Denise Bilott so we can start planning. The officers will be promoting this through all local media and plan on making this a celebration of music across our county in all areas of music. We also need concessions! If you have a booster group looking to make a little extra money, have them fill out the concession form. First come, first serve in terms of selling preference. Any group can perform – even smaller combos/ensembles that you may have! Drew Myers (tuba) was selected from Franklin Regional High School to the NAfME All-National Honors Band. Drew performed with the Band in Nashville on October 30. Congratulations Drew!! The Yough Concert Band had a unique performance. They held an “Autism Friendly” Concert for the Autistic, Learning Support & Learning Disabled students of their district and the NHS school at St. Edwards in Herminie. Their concert was Thurs. Dec. 19 at noon. They performed portions of our Christmas concert, and then invited students on the stage to watch the band while they played. Students had a chance to play on various percussion instruments. After a small party, students got a small gift before returning to their schools. See the article in the Trib here: http://triblive.com/news/westmoreland/5279559-74/autism-band-concert#axzz2pLN3ESNR. What a fantastic idea, congratulations to Don Green and all of his kids! Lindsay McConahy (Latrobe Elementary General Music and Chorus) and her husband Mark welcomed their first child on September 26, 2013. Daughter Kendall Denise weighed 7 lbs, 11 oz. and was 19.5 inches long. Greg Ondayko (Norwin High School Band and Music Technology) and his wife Michele welcomed their first child Ava Rose November 26, 2013 at 10:28PM she weighed 6 lbs, 9 oz. and was 19.25 long. In 2013, approximately 40% of WCMEA’s membership forms were accompanied by a personal check instead of a school district check. Because of this, we decided to give members the option to complete their registration online using credit/debit cards or their bank account. Members can register at any time and they will not be required to send in a separate form. Please email Jaime West if you have any issues accessing the system or paying using the PayPal site, or if you have any suggestions on how to improve the system. Senior High Chorus: Nov. 14-15th at Derry Area HS, host Melody Vigo, guest conductor- Daniel Shaw. Congratulations to Carla DellaPenna (Jeannette SD), Karl Priore (Kiski SD) and Steve Tribble (Greensburg SD) for your 25 years of service! On behalf of WCMEA we all thank you and wish you the best school year yet! Our billboard “Music is Medicine for the Mind” is still located on Route 22. A new company bought out the billboard group that helped us so much and as of right now, our deal is the same. Our scholarship winners last year were for chorus Rachel Read (Penn Trafford) and for band Taylor Gephart (Southmoreland). After taking suggestions at every festival meeting, a committee met this summer to put together a proposal to use unspent scholarship monies from the past years. Their proposal was to offer a $500 scholarship to a Westmoreland county resident music education major (who can be attending any college for music education). Students must submit an application with an essay, lesson plan and transcript to apply. The officers will meet to choose a winner. One of scholarship winners in high school can win this award as well. This was voted on and approved. From Denise: this year we will be taking nominations for the VP position starting in October 2014. This person will serve as VP for two years, president for two and past president for two. In this day and age, we all understand that a school district will not let you out to attend all festival meetings, and as officers we split the duties to attend festivals and selection committee meetings. Personally, I have really enjoyed my time as an officer and meeting everyone! If you have questions about the position or what is involved, please ask! First a big thank you goes out to Dan Lauritzen who took care of our web site for years! We really appreciate your service to our organization. This year, when discussing format and material included, Jaime West took Dan’s hard work and moved it into a new web hosting site. There are great new features, including a Google calendar that you can sync to your phone and online payment of dues (next year!). If you have pictures that don’t have students’ faces up close or permission from students’ parents, submit those to Jaime West to be included! For all the members who pay their own dues, we are offering an online option next year. Since we will be charged a fee for this service, online dues will cost $16 (one dollar fee). This will be through PayPal. This was voted on and approved by the membership. This year we had a question about the 25 year award and its qualifications. We noticed there was not anything in our bylaws about it. A discussion was held regarding the wording at the meeting and it was decided to take this to the festival meetings this year, gather suggestions and form a committee to put something together this summer. If you want to be a part of this committee, contact Denise Bilott or Ray Hammill. On Saturday, May 31, 2014 from 1-5PM, we will have a WCMEA concert in the park. We are looking for performing groups from any grade level from K through collegiate in band, chorus and orchestra of any size or genre. You will have a 15-20 minute time slot to perform. We are also looking for any booster groups for concession stand sales. Each group will sell one item (nachos, bottled water, hot dogs etc.) for a $20 table fee. At this point, we are just looking for interested groups and in the winter we will organize this in much greater detail. The officers plan on promoting this in all possible venues to get PR for all our programs and everything we do throughout the year. The forms are on our web site and will also be sent via e-mail. If you have any questions, please contact Denise Bilott. Seton Hill University is offering their Seton Hill Youth Honors Band and Seton Hill Youth Honors JAZZ Band. Forms and audition selections are on the web site. It was also announced that a new Seton Hill High School Honors Band will start this year. Any student that would like to be in Junior High District Band at Norwin and Seton Hill Youth Honors band/jazz band may do so. We are also working on a collaboration with Jamey Aebersold, he will be doing a workshop with the district band teachers Saturday morning and then working with the Seton Hill honors jazz kids that afternoon. Information was sent earlier regarding the Westmoreland Symphony Orchestra’s concert for young people. Funding has become an issue for bussing and tickets for many districts.